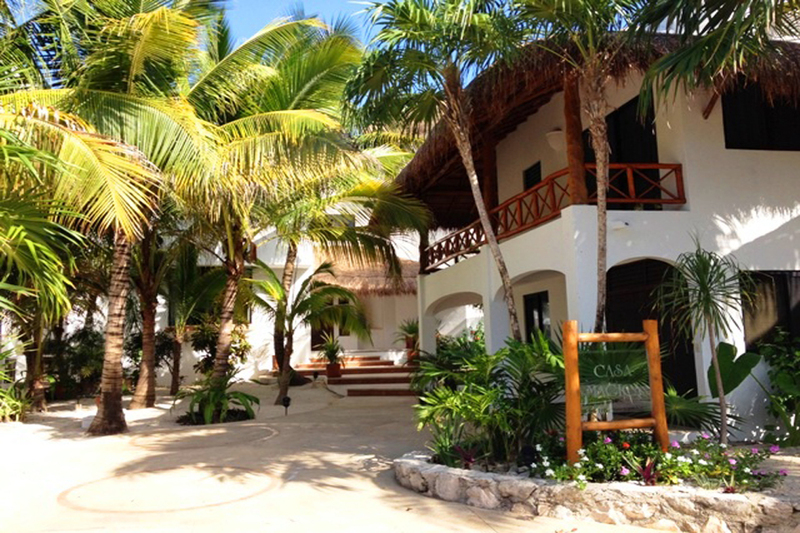 Nestled on the white sand beaches of Jade Bay, amid lush tropical palms, lies the wonderful Casa Magica. 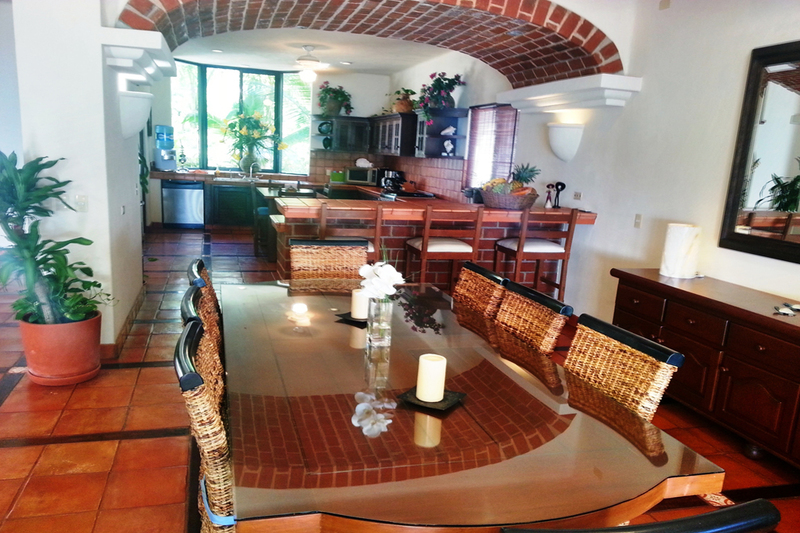 This dream home will cast a spell over you and entice you to vacation in absolute luxury! 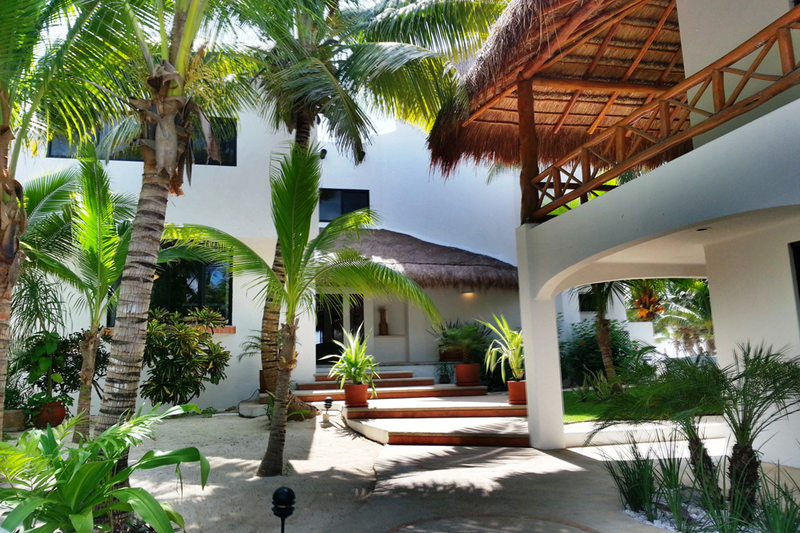 Casa Magica Casa La Via is 5 mins from Akumal, 20 mins to Tulum, 15 minutes from Puerto Aventuras and 30 mins to Playa del Carmen, by car! Upon entrance, feel your stresses fade as the warm earthen colors used throughout the villa embrace you and lift your spirits. 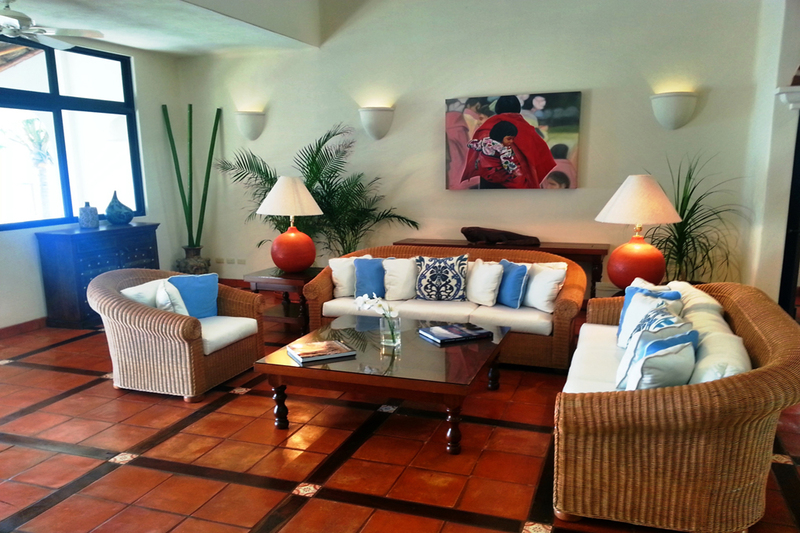 The decor, best described as a rustic tropical charm, blends modern comforts with the appeal of ancient worlds. Statues and ceramic figurines adorn small corners and spaces, catching the passing eye. 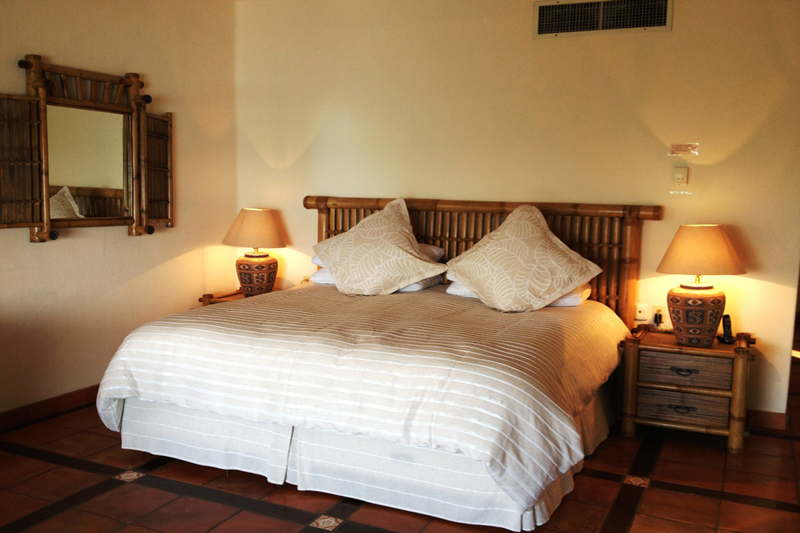 Scattered thoughtfully about the entire villa, large ceramic painted pots, housing palms and other plants, help all rooms come to life. An open and spacious floor plan creates a sense of unity among the living, kitchen and dining areas. The elegant wicker sofas piled high with pillows of warm greens and reds create a cozy living room, while the two-story domed brick ceiling towers majestically above. 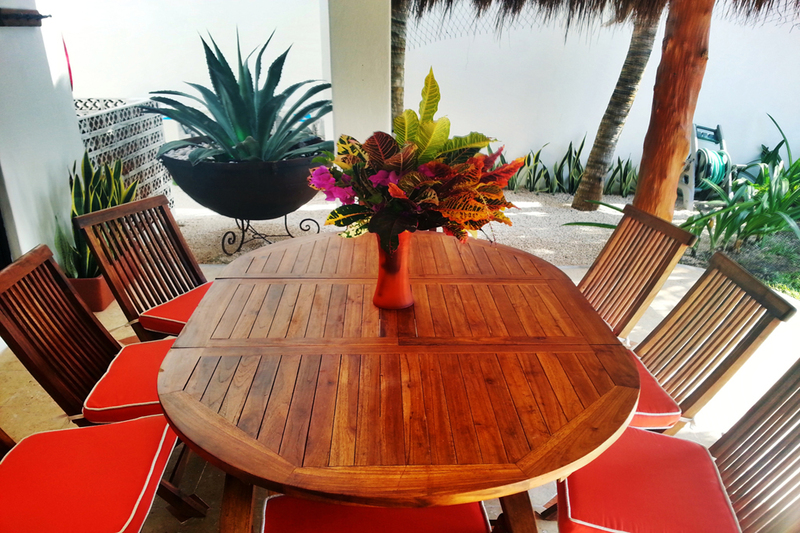 The solid wood dining table, surrounded by eight fabulously comfortable chairs, entices you to try a traditional Mexican feast prepared and served to you in this ideal location. 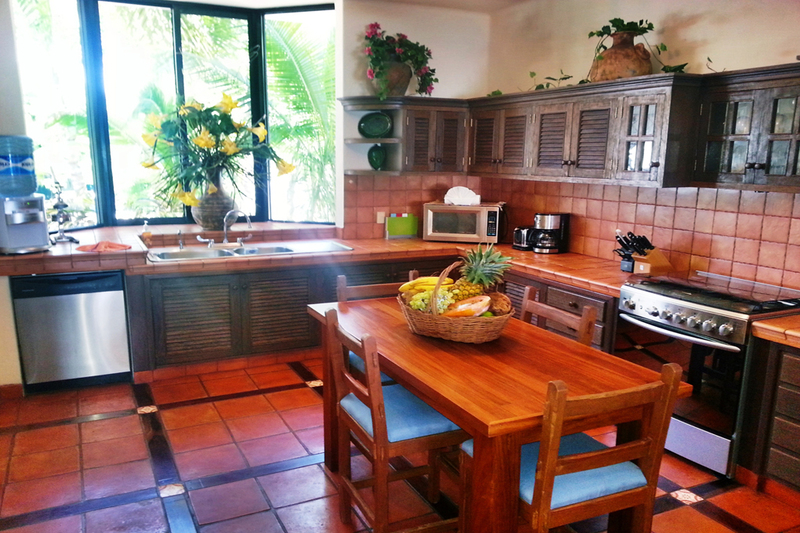 Or, if you would rather create your own dining delicacies, this enormous and completely equipped kitchen will appease even the most discerning chef! Stepping beyond the glass doors of the living and dining areas, an amazing pool and graciously covered patio areas awaits you. Deep blue and inviting, the pool of varied depths is a perfect place to take a refreshing dip. 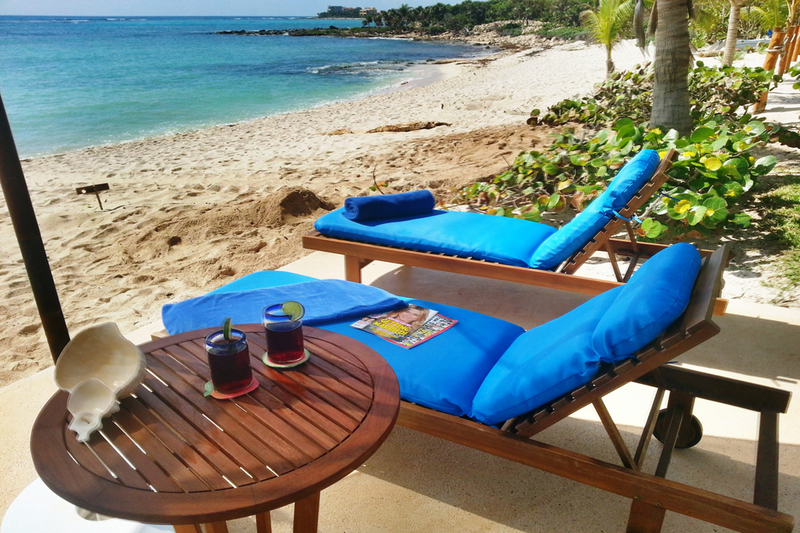 With ledges and steps, there are places for ultimate sunning within the refreshing waters. Framing the pool is lush, soft lawn intersected with small, cement pathways which lead to individual sunning decks. A unique wooden gazebo borders the pool providing slightly shaded, oceanfront seating - the ideal location for sipping afternoon margaritas! 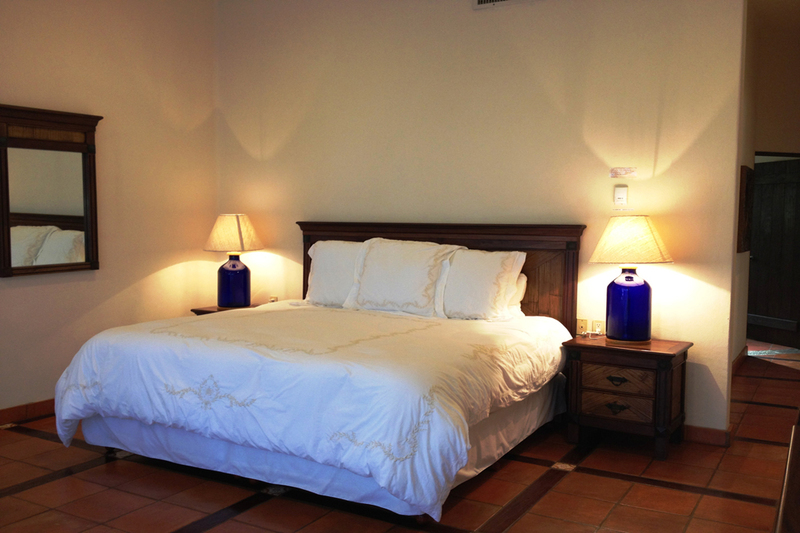 The downstairs master suite has huge sliding glass doors leading out into this wonderland. 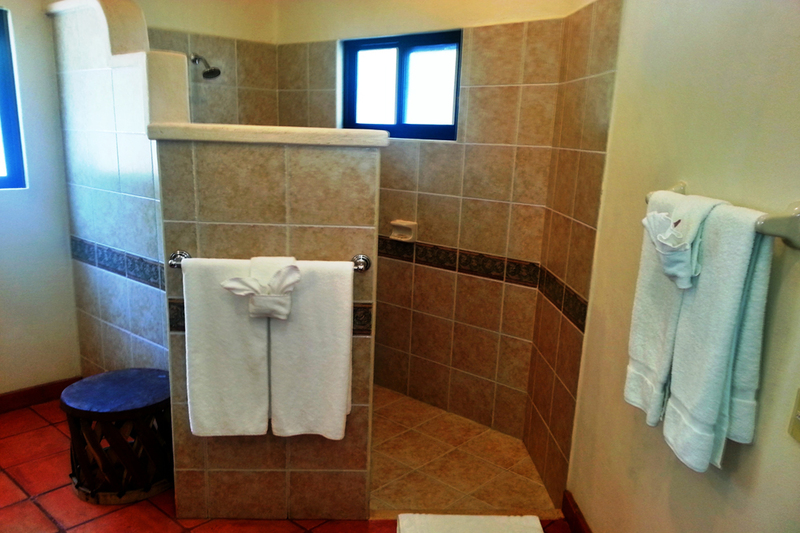 Within these doors, you will find the ocean view king-sized master bedroom, with a huge bath and oversized shower. 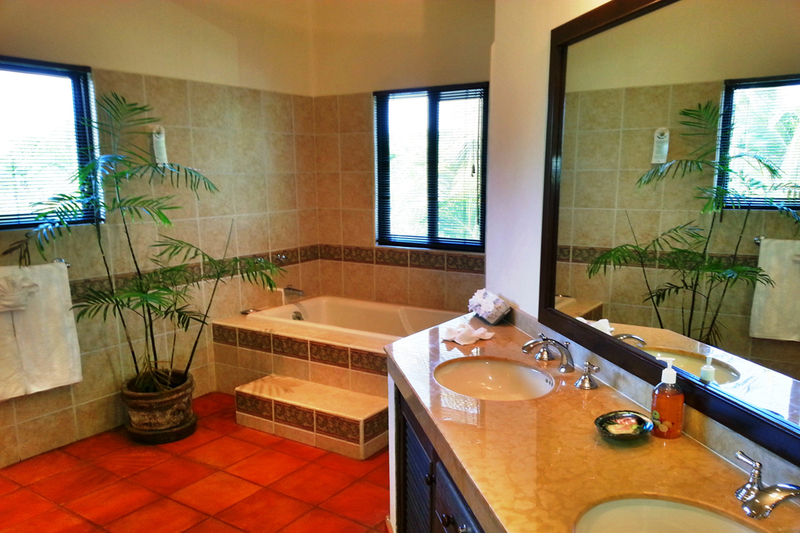 The nearly identical upstairs master suite offers a private, covered, oceanfront balcony as well as an enormous bath with double sinks and an oversized shower and tub! 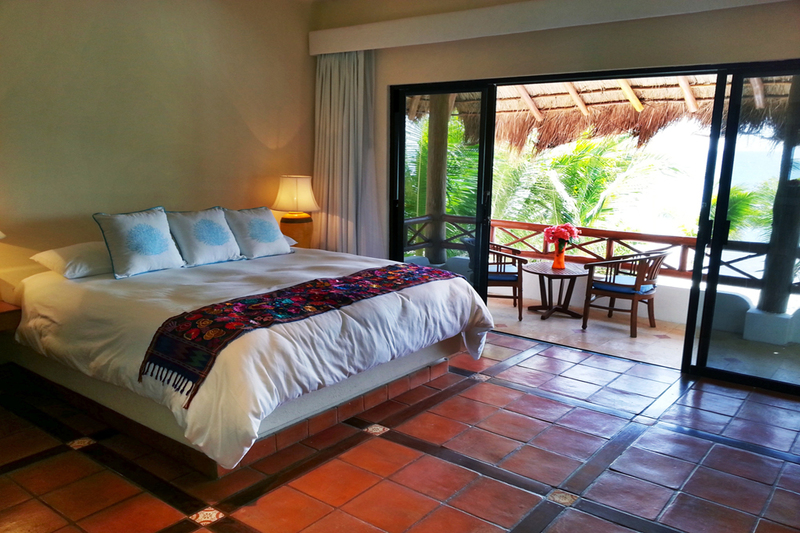 Wake up to a mesmerizing view of the turquoise and emerald Caribbean waters in the third bedroom as well! Offering a king-sized bed and private bath, the focus of this room drifts to the exclusive and enormous oceanfront balcony. 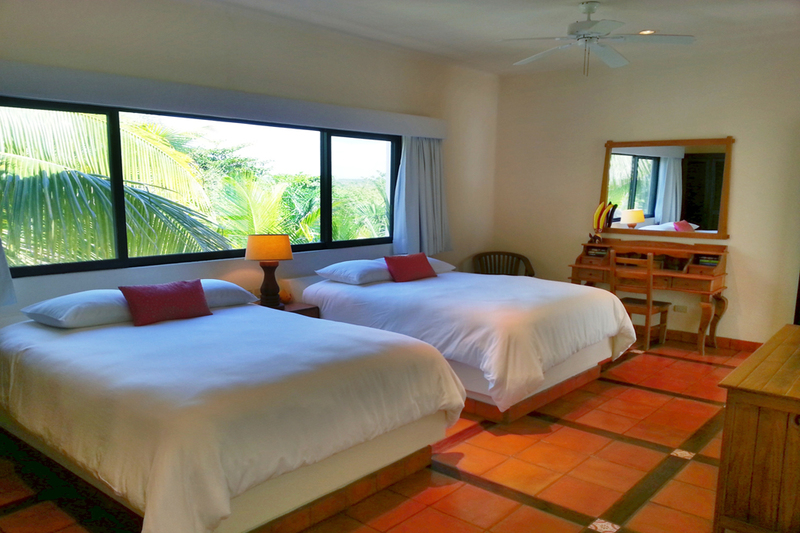 Finally, the darling fourth bedroom, which houses two queen beds and a private bath, showcases a jungle view through enormous panoramic windows. 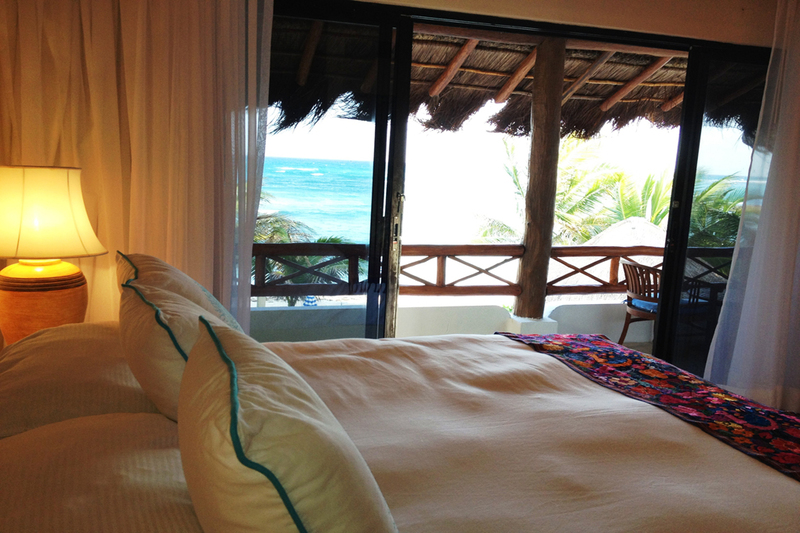 Also containing its own private ocean view balcony, this bedroom lacks nothing. 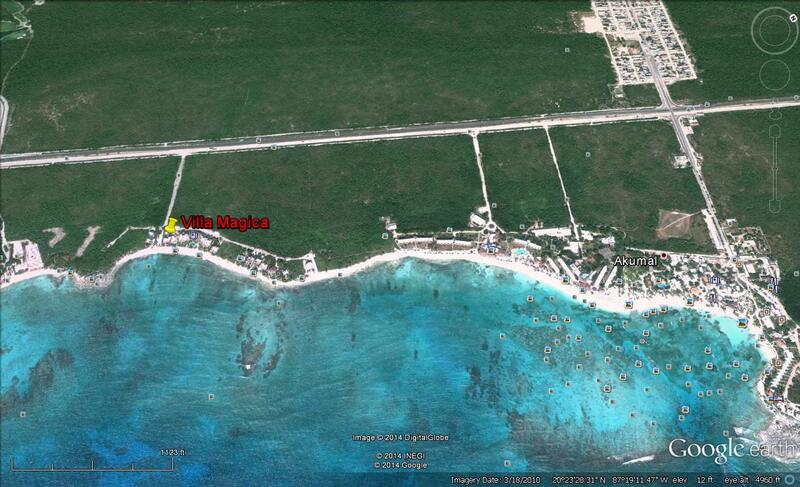 As one of the newly discovered beaches in the Riviera Maya, Jade Bay is a secret worth mentioning. Inhabiting its protected, crystal clear waters lie incredible corals and colorful tropical fish just waiting to be snorkeled among. During the summer months, endangered sea turtles will exit the ocean and lay their eggs on the beaches of Jade Bay. You chance being witness to the exquisite natural wonder of watching droves of baby turtles erupt from their nest in the sand and make their way to the sea. Truly an experience of a lifetime! 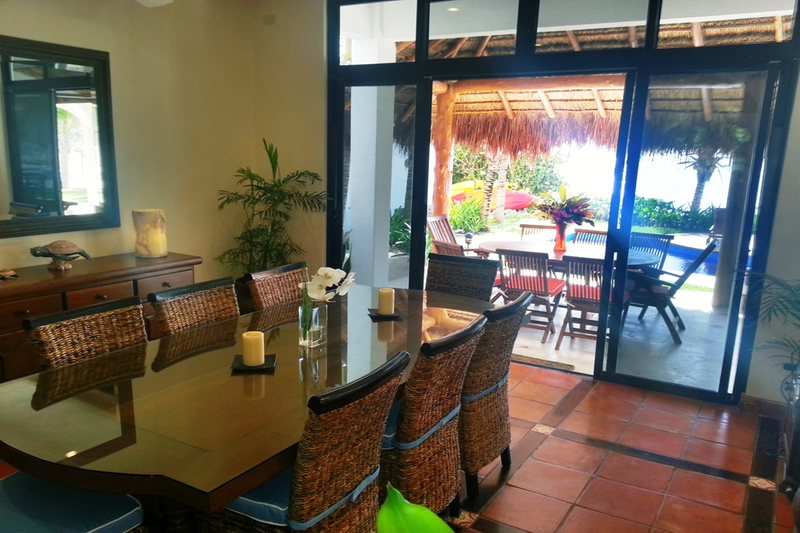 While private and quiet, Jade Bay is only a short stroll along the beach to the heart of Akumal, with shops and restaurants, diving facilities, and much more. If you are the adventuresome type, discover the mysteries of the Ancient Mayan civilizations, go shopping along 5th Avenue of Playa del Carmen, take a deep sea fishing excursion, treat yourself to a rejuvenating massage, the choices are yours to make! 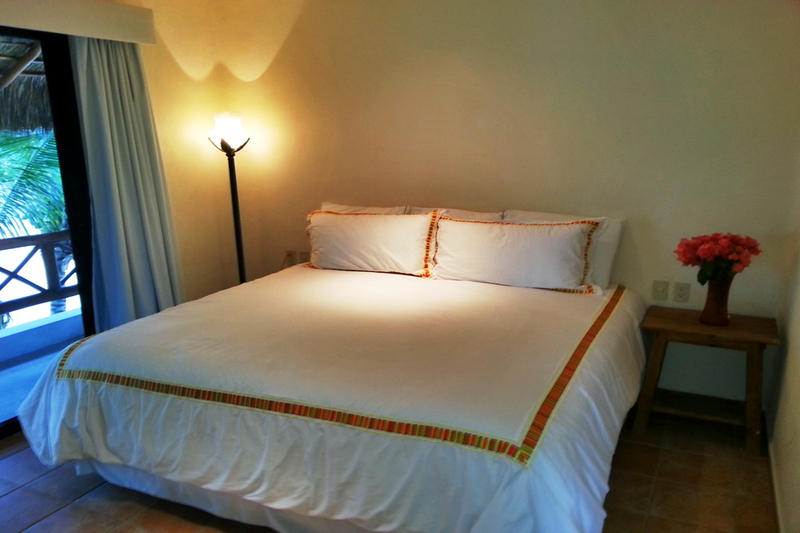 Add $500 per person over the base number of 10 people ($250 for children 9 and under); max occupancy 12. We had a lovely stay here at Magica. The house is well appreciated and the house is very comfortable. We were fortunate to see the green sea turtles lay their eggs and some hatch out and lead to sea. For the week we were here I reallly didn´t have a care in the world. Thanks. Reina + Marcos attended our every need. Kim, Mikenna, Heather Lloyd, Archie Harckle, Tina, Crystal-Lynn. Beautifully maintained, amazing food by Alastino and congratulations to Marcos. Lot of fun had by all. 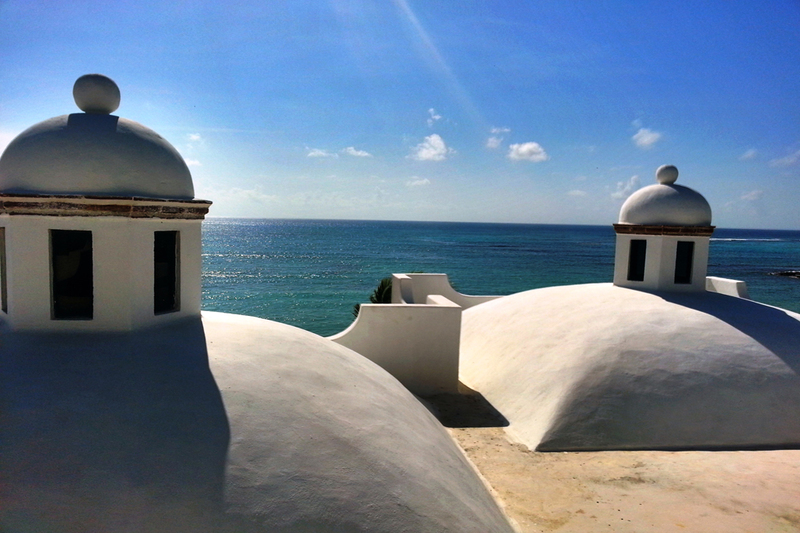 saw 2 sets of turtles hatch, snorkeled a lot, Yal-Ku kayaking, catammaran ride on full moon night. All awesome adventures! And of course tour of Tulu ruins. We had 3 dinner, prepared for us by Manuel the chef, Yummy! Reyna takes good care of inside of the house very well. Hector takes care of the securityso we feel very safe. And we met Marcos who was busy taking care of his long awaited baby daughter. Thanks for sharing your beautiful home! Lynn, Kevin, Marc, Laurie + Jim! Arrived to a stunning viewat the ocean from the living room. We were from Big Harbor, WA; Port Ludlow, WA & Dallas,TX. One of the highlights of the trip are the sea turtles that make their way up to the beach and lay 80-100 eggs. When the eggs hatch all the babies, quickly travel back to the safety of the water. Thank you for your beautiful house and comfort. 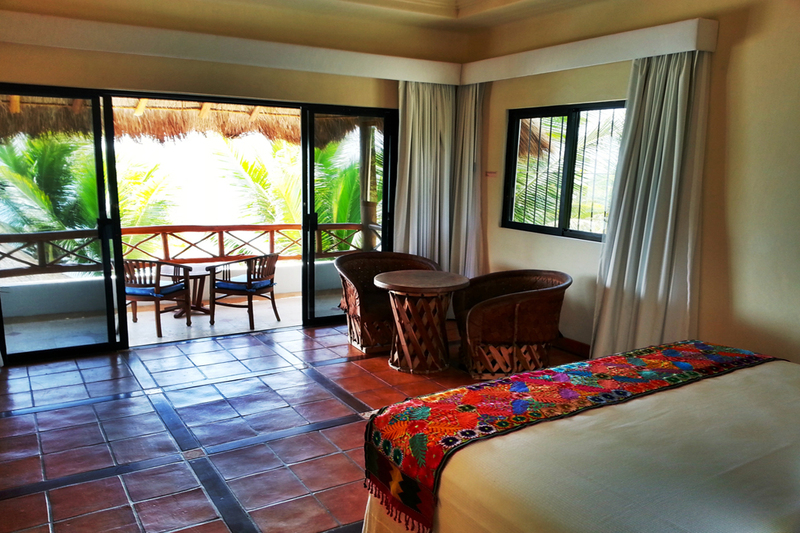 I got staying in the wonderful suite up stairs.The place to be able to experience the turtle lay their eggs and the baby come to light & go back to the sea. What a great experience for me to share with my granchildren Bella & Fia. Thank you. We had a fantastic week at Casa Magica with Marco and Reyna. The house is beautiful and spacious. Our party consisted of two families; 4 adults and 7 children (aged 1-9). 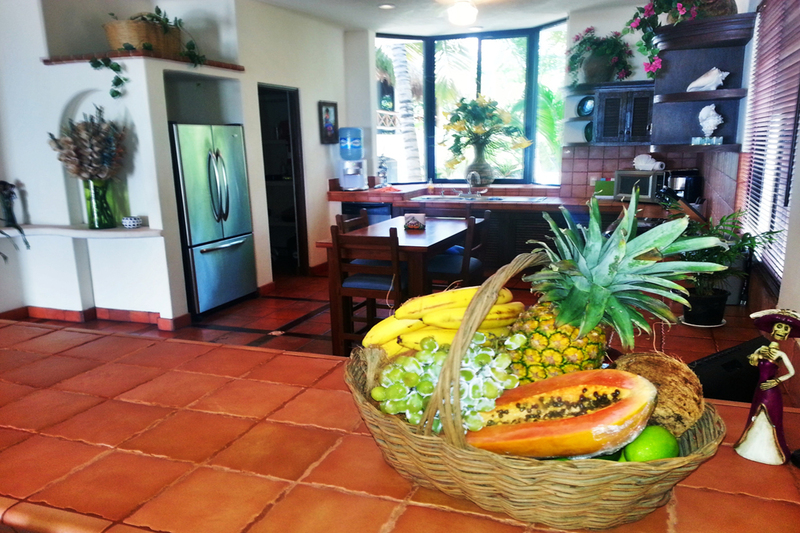 Shortly after our arrival Gustavo visited us at the house and gave us a basket overflowing with fruit, which was very generous! 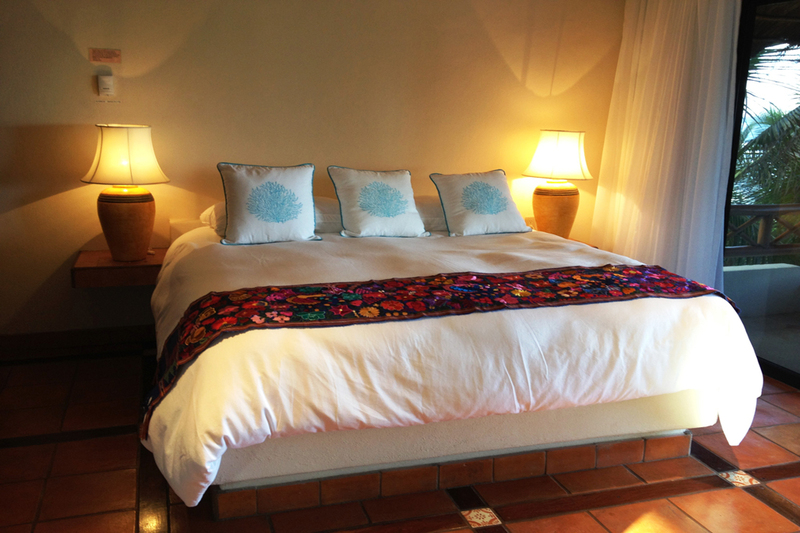 Each of the large bedrooms is beautifully decorated and gave our families some privacy. 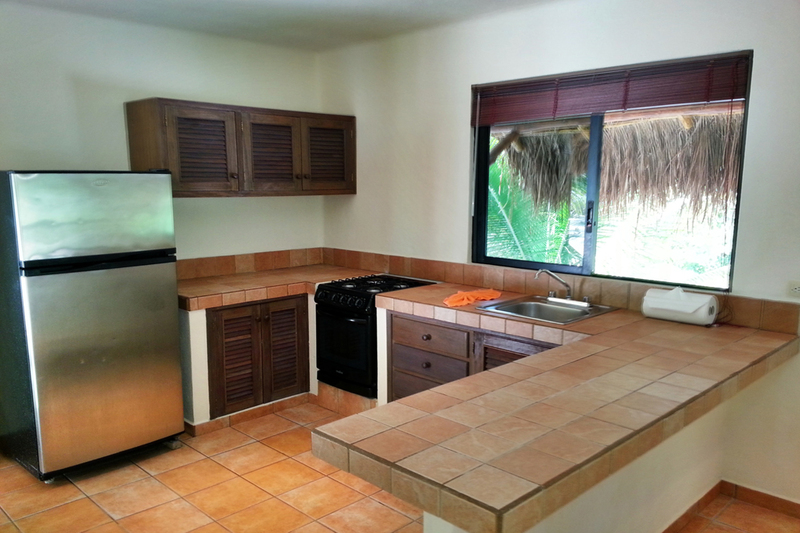 The kitchen was very well stocked with cookware and an assortment of dishes. 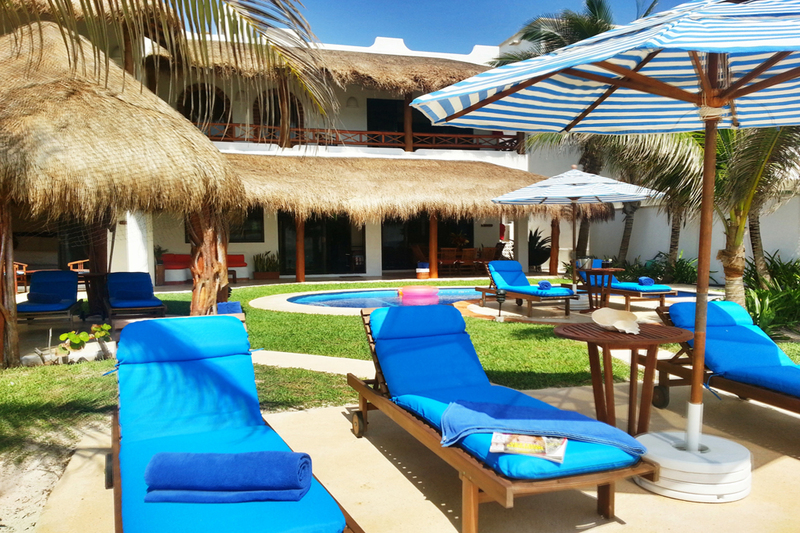 The yard was in excellent condition, with comfortable beach loungers and lots of shade under the cabana and umbrellas. The landscaping is beautiful and very well maintained. Marco and Reyna were perfect hosts and we were sad to say good bye to them. 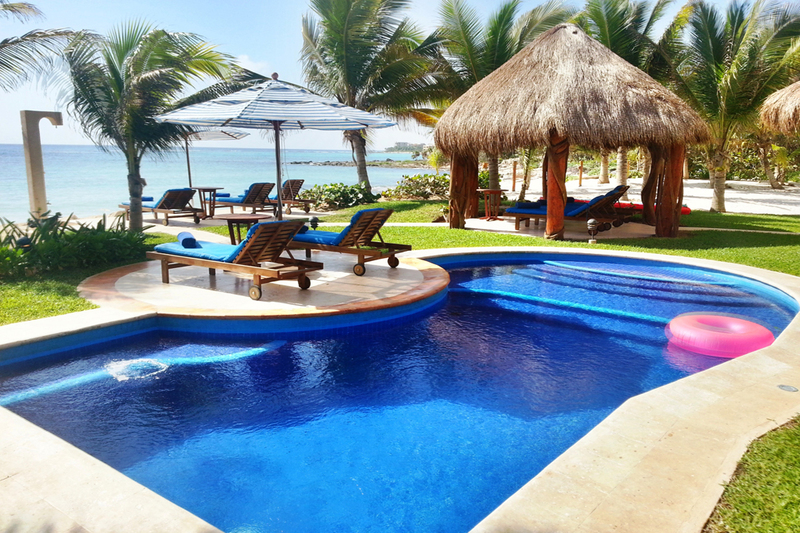 We thoroughly enjoyed swimming in the pool with the children and exploring the beach every day. Unfortunately the weather was too windy to make use of the kayaks as the waves made it unsafe. 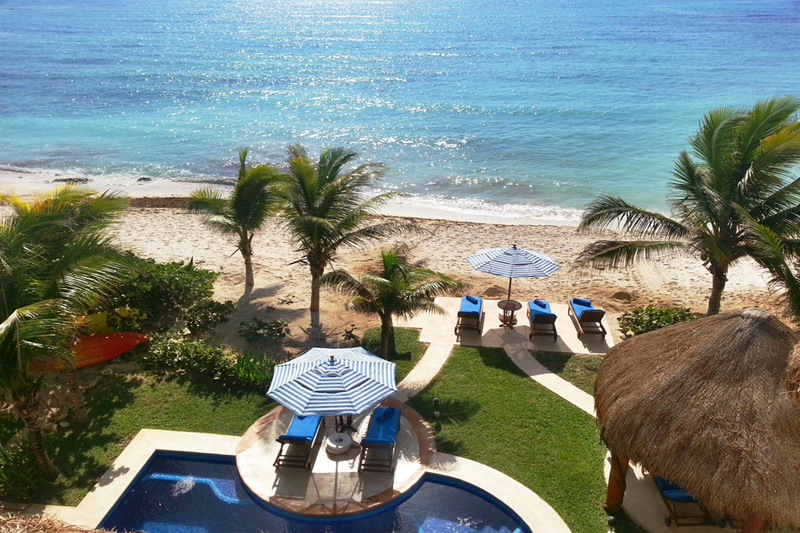 We enjoyed several days playing in the sand and swimming/snorkelling with the children in Akumal. We spent a day at Xcaret where the children enjoyed seeing the animals and swimming at the beach in the tubes. The evening performance is excellent and we would consider returning to Xcaret just for the evening performance and the meal option. The other family that stayed in the home with us also spent a day at Xel-Ha and were very impressed with the variety of fish they saw. 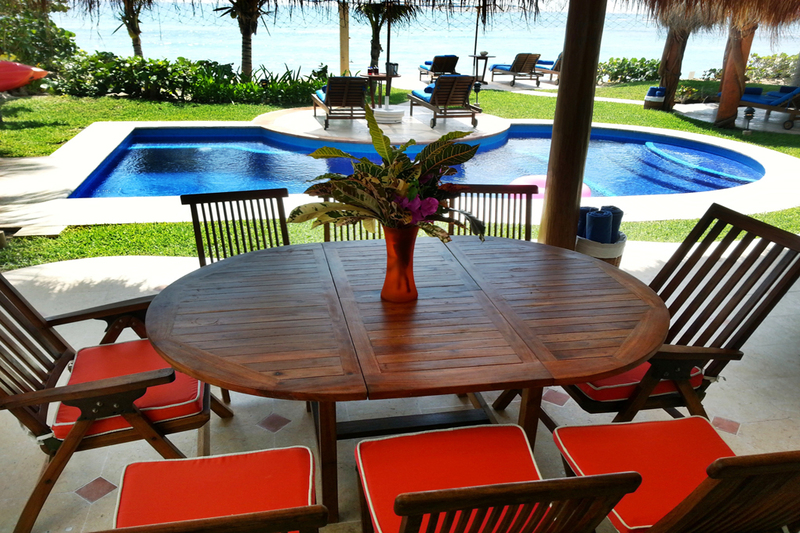 The house is very conveniently located along the coast, making it easy and quick to visit Playa del Carmen for some shopping or explore the ruins at Tulum. 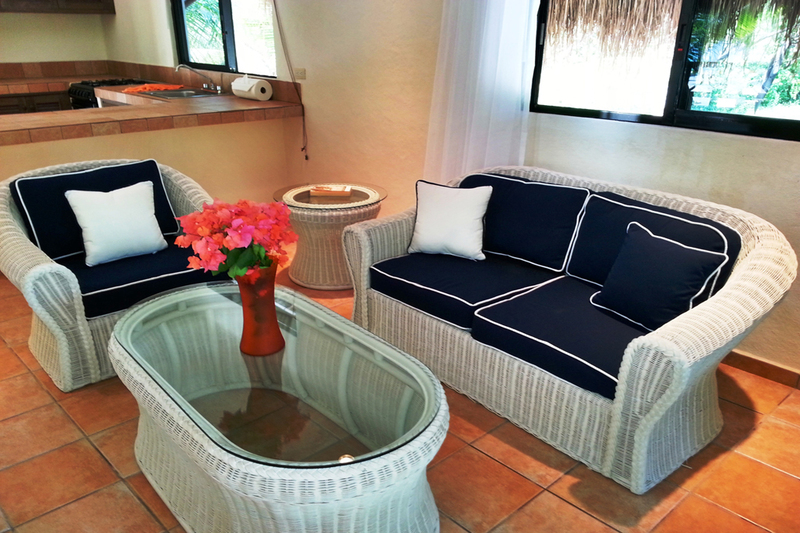 We would definitely consider returning to Casa Magica again and would recommend the home and its staff without hesitation. Family for 8, The house is a perfect setup for us. Loved the beach chairs outside along with ample umbrellas. Very clean & kept up. Marcos and Reyna were the best. They kept the house cleanevery day. We hired Reyna to cook us breakfast and dinner every night - Really worth it and very affordable° We had our choice of what we wanted for each meal. They both were very accommodating. Very enjoyable time. WE WILL BE BACK! We had excellent time at Casa Mágica. 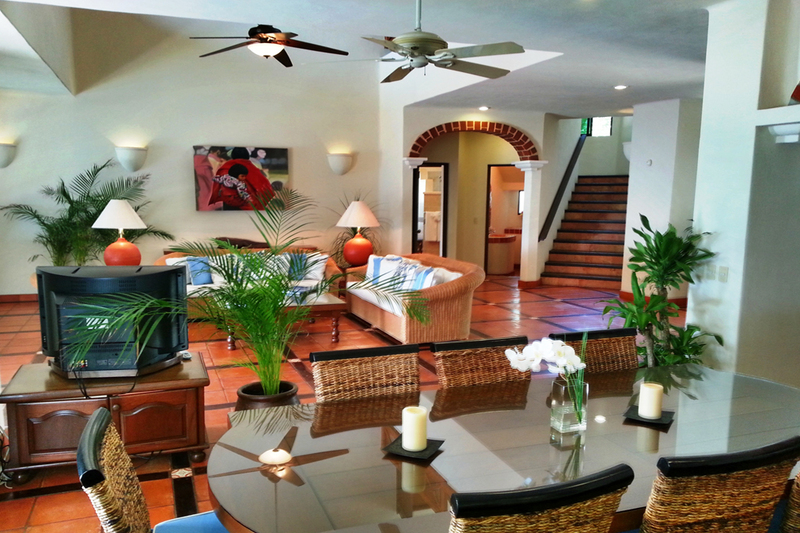 The house is beautiful, an ideal place to rest and recharge your batteries and have fun with the family. The staff is very friendly and the sunrise is breathtaking. Only issue we had was with the Internet, not allowing you to send longer files. By the way, do not get into the Kayaks without proper shoes, we learned our lesson when our kayak was stuck at the Coral reef. Better use wet shoes at all time! Muy buena casa y buen servicio. No es la mejor playa de la zona pero se puede entrar al mar por una apertura entre los corales. Beautiful, spacious, well-maintained home with all amenities. Staff members Gustav, Maria and Marcus worked hard and couldn't have been kinder. Casa Magica was more beautiful than the pictures! I wanted to send an email telling you how wonderful everything was. We had a great time! Everything was perfect. The house was lovely -- the pictures really don't do it justice. Rayna and Marocs were so friendly, helpful and nice. The food was great! 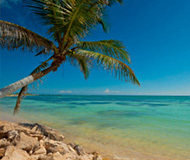 Akumal is a great little town and is an easy beach walk away. Oh yeah, and the beach. So beautiful!I miss it already. My friends declared me the biggest beach bum of the group! I am happy with that title!